From NY Post article by Mike Vaccaro, 7/26/08, "Start to Finish, This Was Classic"
who picked up the last five critical outs Friday night." From NY Post article by Kevin Kernan, 7/27/08, "Hank Was Right on Joba Switch." 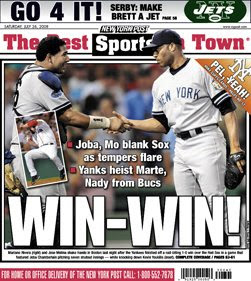 7/16/08, "Rivera was spectacular. He threw 26 pitches, 18 of them strikes. he was as graceful as he always is. 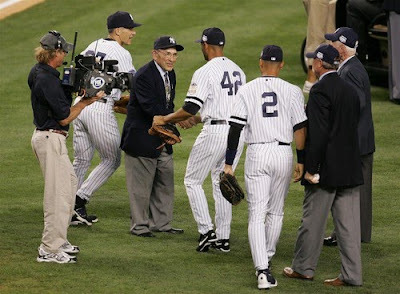 From NY Sun column by Tim Marchman, 7/16/08, "A Legend Among All Star Games"
(Mike Lupica): "We will make this more than it is this week at Yankee Stadium, the last All-Star Game in the place, maybe the last great baseball occasion in the place if the Yankees don't find a way to make the playoffs this season. All the way until the last out Tuesday night, we will hype this up as if it were the Super Bowl of All-Star Games, or the Olympics, because it is the Stadium and it is the Yankees and it is New York and it is, after all, what we do here. We will, to the end, continue to call this The House That Ruth Built, even though it is not, it is not Babe Ruth's Yankee Stadium, not the one he saw from home plate or Joe DiMaggio saw or Yogi or The Mick. It is The House That Mayor Lindsay Rebuilt in the 1970s, unless you think you can still walk across the outfield grass and past the monuments when the game is over and it is time to go home. not have to be hyped up as he stands with one last collection of baseball stars and the baseball ghosts of this Stadium and the one before it that Derek Jeter is always talking about. as much of an immortal as any Yankee, as Ruth or DiMaggio or Lou Gehrig or Mantle or anybody. The beauty of baseball and the beauty of sports is that there is always a debate about this giant of the sport or that. Some will say that Ruth will always be the biggest player of them all, has to be, just because of the distance he put between himself and the rest of the field when he seemed to invent the home run in baseball at the same time he was inventing the Yankees. But there will be others who say that the best player of them all was the great Henry Aaron or Willie Mays and maybe someday - if he ends up getting enough rest to hit 800 home runs - some will say that Alex Rodriguez, Mr. Fun, was the best ballplayer of them all. There will always be the debate about starting pitchers, all the way back to the real Cy Young. They will fight about whether you would give the ball to one of them if you had to win one game, or give it to Sandy Koufax or Bob Gibson or Tom Seaver or Steve Carlton or somebody else. in the history of baseball. no other Yankee has been better at what he does than he has been. And, at the age of 38, still is. The other day he was talking about the 2008 Yankees, as flawed as they are, and how even through the injuries and the terrible hitting they have still managed to hang around in the American League East this season. Maintained contact with the Tampa Bay Rays and the Red Sox. "They know we're still here," Mo Rivera said. ahead of John Wetteland. You want to know how long Rivera has lasted, how long he has pitched at this high level? Wetteland, long since retired, was born in 1966. Rivera, who will turn 39 this November, was born in 1969. And will be at the Stadium tomorrow night. Rivera pitched three innings at the end of Game 7 and seemed perfectly willing to pitch all night if it meant putting the Yankees back in the World Series. Mo Rivera ran for the pitcher's mound at the Stadium and dropped to the ground in celebration. "The best," Torre said of the game that night, and the way it ended. it took Rivera's best to get them there. He hasn't always been perfect, because no one is, so there was the night when Sandy Alomar Jr. beat him in a game in the first round and helped knock the Yankees out and there was the bottom of the ninth in Game 7 against the Diamondbacks and there was the worst night of all, for him and his team, when he couldn't get the last three outs he needed against the Red Sox, Game 4 of '04, and keep the Red Sox down against the Yankees, where they had always been. 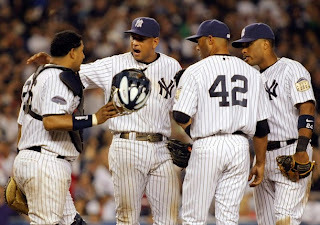 is the greatest Yankee of them all." 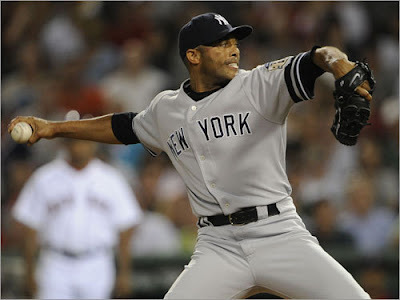 "Mariano Rivera is the Brightest Yankee Star of All," 7/14/08, Mike Lupica column in the NY Daily News. And Mike Lupica is the bravest NY Daily News employee of them all. not Whitey Ford - is the greatest pitcher in the entire Yankee history." because Francona was asked about it by reporters. (This was a bad idea and "a media creation," as noted on Red Sox radio). "We will treat every player in this game with a lot of respect, certainly knowing that there are Yankees in this game -- but other than that I think doing it correctly." Francona wouldn't commit to calling on Rivera to close out a ninth-inning lead, saying he didn't want to divulge his plans. (Mike Lupica, NY Daily News): "Girardi was long gone by then and so was Joba Chamberlain, who gave the Yankees six solid innings even if he got sloppy in the fifth and gift-wrapped three runs for the Red Sox. Mo Rivera, who had pitched two more innings on this night, he was gone. Mo's big moment this time was when he struck out Manny Ramirez, pinch-hitting in the top of the ninth with the go-ahead run on third and two outs. the greatest closer of all time against one of the great righthanded hitters of all time. Except it was "no mas" from Manny of Washington Heights all the way. Big meeting on the mound before Manny's at bat, Arod giving Molina a pep talk. Top of the 10th, tie game, Rivera's second inning, go-ahead run in scoring position. But Manny apparently had no intention of swinging.